Any professional salon needs to either rent or purchase spa linens, robes, and other necessities to keep clients coming back. Finding a company that provides high quality robes, towels, spa towels, wraps, and more can be difficult. Trust a company that has been providing quality wholesale spa linens, robes, and more for many happy hotels and resorts for years. 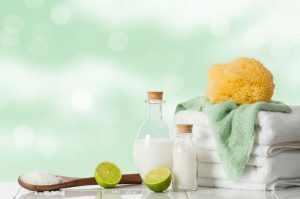 Whether you’re running an independent salon or a spa in a hotel or resort, the professionals at Riteway will help you find the perfect linens in classic styles and colors that will impress clients and give your establishment the luxury feel that salon patrons have come to expect in a high-end resort. Choosing styles and colors of specialty salon linens can be difficult. Customers will often associate light colored linens with cleanliness which can mean many return customers. Another important part of running a salon is making sure all your robes, towels, or any other linens that clients come in contact with are clean, laundered, and properly sanitized in between each and every use. If your standards for providing clean linens to client is high, your salon will stand out in the eyes of clients. Riteway follows strict standards when it comes to cleaning spa linens. Riteway is a GREEN linen service with a water recycling system that recycles 80% of the water thats used in the laundry process. Riteway takes pride in its commitment to preserving the environment as well as providing the most fashionable and luxuries linens available. Leave a lasting impression on all of your salon clients by pampering your spa guests with luxury spa linens that have been completely sanitized, pressed, and cleaned to impress even the pickiest of spa and hotel customers. Give us a call today at 772-336-0175 for a free custom quote or by filling out our quick online request form from our qualified professionals today!